Product #15683 | SKU BSRC10 | 0.0 (no ratings yet) Thanks for your rating! 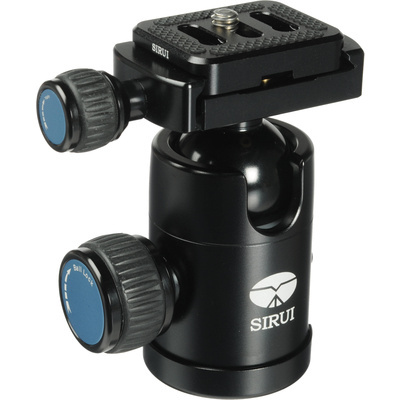 The Sirui C-10X Ball Head is an extremely sturdy head with separate control knobs for pan, tilt, and tension, plus an Arca-style clamp for the included quick-release plate. The head tilts 90° for portrait orientation, and the quick-release plate features two pop-up pins that prevent camera twist when it's tilted 90°. There's also a video pin on the plate to keep camcorders from twisting. The ball locking of the C-10 head is extremely strong thanks to the double-bevel locking system, which helps yield a high load capacity of 15kg. The quick-release clamp features a secondary release button that prevents any inadvertent disengagement of the camera/plate from the clamp, thereby adding to the head's overall security and stability. The three separate controls allow a photographer to exercise extremely fine control over the orientation of the camera, whether it's a DSLR, medium-format camera or a camcorder. Pan, for instance, can be adjusted while the tilt stays locked, enabling precise movement that's measurable – there are degree markers at the panning base for panoramic photography. The C-10 is CNC-machined from an aircraft-grade aluminum alloy and anodized with an oxidation treatment that ensures a durable, high-quality finish. Each assembled component of Sirui Ball Heads is produced by CAM (Computer Aided Manufacturing) - the ultimate in precision manufacturing techniques. Sirui ball heads are made of aviation quality aluminum alloy 7075-T6 and 6067-T6 for long life and maximum strength. Sirui uses a special manufacturing technique that produces the support ball with tolerances to within 0.01 mm of a perfect sphere. This uncompromising precision guarantees superior performance and smooth operation for any type of 35 mm DLSR, medium or large format camera system. The interior locking system in Sirui Ball Heads uses SIRUI designed double bevel locks for superior locking performance and reliability. Most ball heads only use a single, less efficient interior locking system. The patented safety lock design of Sirui quick release plates effectively prevents the camera from accidentally sliding off of the ball head. Although most brands of Arca-style quick release plates can be used on Sirui ball heads, the safety lock feature is limited to Sirui plates. All Sirui products undergo a special anodized surface treatment that makes all metal surfaces highly resistant to wear and increases durability and weather resistance. Anodizing is an environmentally safe electrochemical process.